The Hindle Evolution Megaphone full system for the 2017-2019 Yamaha YZF-R6. Manufactured from super lightweight stainless steel, this system weighs just over 7 lbs. in total. Brand new! Hindle Evolution Megaphone Slip-On for the 2017-2018 Yamaha YZF-R6. Uses our one-of-a-kind Evo Megaphone. Brand new - the Hindle Exhaust system for the 2017-2019 Yamaha YZF-R6 is now here! Super lightweight (only 7.6lbs.*!) stainless steel construction with your choice of muffler style. Hindle Slip-On Adapter for the 2017-2019 Yamaha YZF-R6. Mounts the muffler down near the foot peg (stock location). A great way to get the Hindle Exhaust looks, sound and performance without needing to replace the entire stock exhaust system. 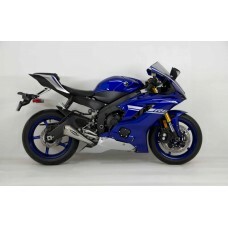 The Hindle Exhaust Yamaha YZF-R6 (2006-2016) full stainless steel system is super lightweight (only 7.6 lbs.*!) and puts out an amazing horsepower increase. 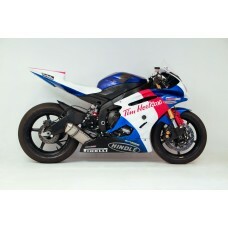 This exact system was featured on many top racers' Yamaha R6 models. Muffler tucks in near the foot peg (in original stock location). Hindle Evolution Megaphone full system for the 2006-2016 Yamaha YZF-R6. Uses our one-of-a-kind Evolution Megaphone in a brushed stainless finish. Hindle Slip-On Adapter for the 2006-2016 Yamaha YZF-R6. Mounts the muffler down near the foot peg (stock location). A great way to get the Hindle Exhaust looks, sound and performance without needing to replace the entire stock exhaust system. Brand new! 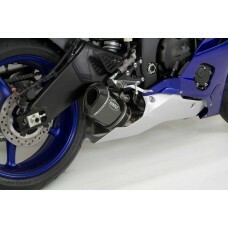 Hindle Evolution Megaphone Slip-On for the 2006-2016 Yamaha YZF-R6. Uses our one-of-a-kind Evolution Megaphone.